No global climate change in the past 20,000 years? | Watts Up With That? No global climate change in the past 20,000 years? Claims such as these can only be considered geofantasy, unsupported by scientific data and contrary to a vast amount of data to the contrary. 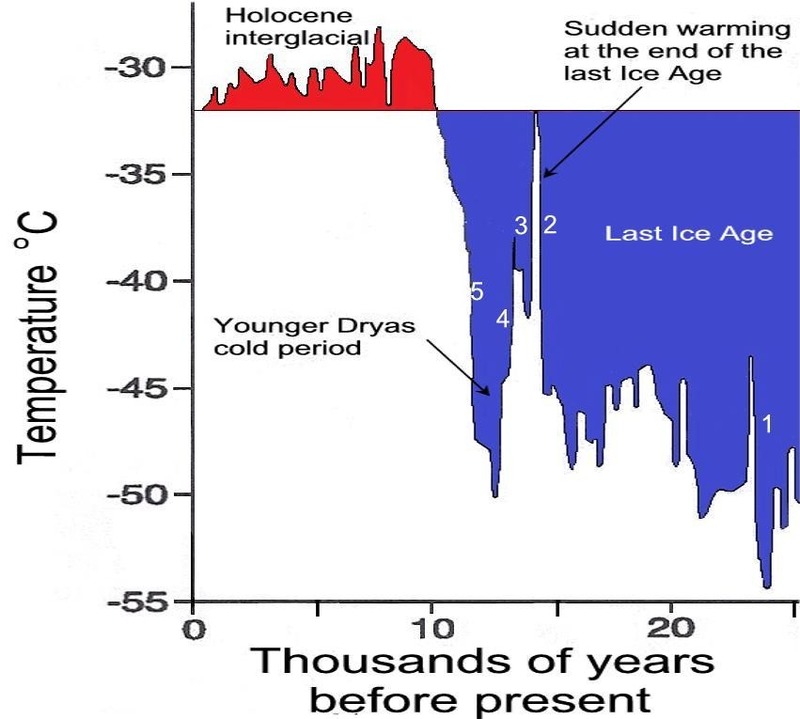 For example, Björck claims that the large swings in temperature at the end of the last Ice Age, especially during the Younger Dryas (YD), were not global despite many peer-reviewed papers (when peer review meant something) documenting the global extent of the YD. The magnitude and intensity of late Pleistocene climate changes were much, much greater than recent warming and cooling (Fig.1). Figure 1. Greenland ice core data showing abrupt warming and cooling events during the past 25,000 years. As shown by corresponding expansion and contraction of glaciers worldwide, these were globally synchronous events. The Greenland isotope ice core data is well correlated with glacier advance and retreat in the European Alps, Scotland, Sweden, Norway, Finland, Russia, the Rocky Mts., the Cascade Mts., Sierra Nevada, Argentina, Chile, New Zealand, and various other places. The global record of non-glaciated areas is also clear in Asia, Australia, New Zealand,, North and South America, Europe, Russia, and elsewhere. There is a vast literature documenting all of these globally synchronous climate changes that Björck obviously needs to read. 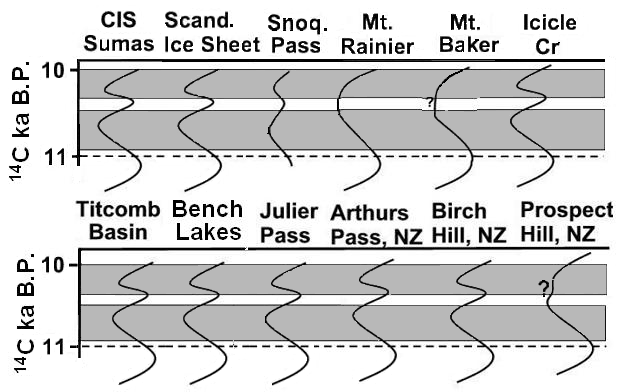 The Younger Dryas abrupt and intense climate changes are not only globally synchronous, but are in fact practically simultaneous in both the Northern and Southern Hemisphere (see for example, Easterbrook 2011, Evidence for synchronous global climatic events: cosmogenic exposure ages of Pleistocene alpine glaciations, Elsevier). 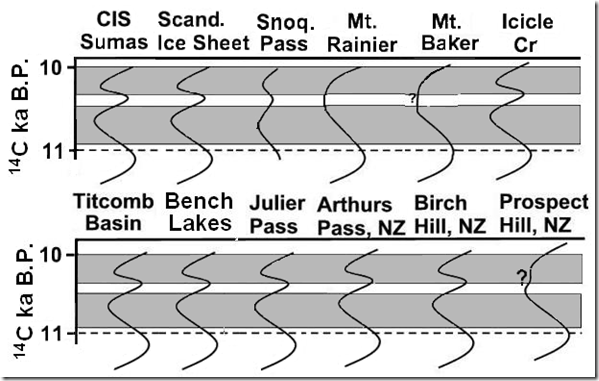 Figure 2, shows that not only is the Younger Dryas globally synchronous, but that advances within the YD can also be correlated globally, including examples from continental ice sheets in Scandinavia and North America, and alpine glaciers in the Cascade and Rocky Mts. of North America, the European Alps, and the New Zealand Alps, among many others. Figure 2. Global correlation of phases within the Younger Dryas. Globally synchronous Little Ice Age glacial advances and retreats are also well documented in the geologic literature, as well as the Medieval Warm Period. Well-defined glacial moraines lie downvalley from almost every glacier in the world! How Björck can ignore this immense amount of data showing globally synchronous climate changes is very difficult to understand. His claim of no globally synchronous climate changes in 20,000 cannot be considered credible. Had to laugh at that one. I predict our planet will ultimately be saved by geologists, who are perhaps the only group of scientists who can understand time on the same scale as the earth understands it. Assuming we can pull them out of the bars. Beer review. That’s all they understand. That’s a discussion on glaciers in Chile….. and then there’s this….. The same is noted for instance by Lucke and Brauer 2004* from the pollen in the meerfelder maar. Furthermore I’d be very interested to see unambigous evidence of advancing glaciers, correctly (!) dated within the Younger Dryas. As far as I know this is only shown for the Loch Lomond glacier advances in Scotland. There are many more fishy things about the Younger Dryas, in general it looks to me that the Younger Dryas was not that cold but bone dry in many parts of the world, but not all. I think indeed that the last glacial transition was more or less synchronous, however the isotope patterns in the Antarctic and Greenland ice cores (incorrectly assumed to represent paleo temperature do not support that. Plenty more where this is coming from. rapid Late Glacial climatic changes in varved sediments of Meerfelder Maar (Germany). Palaeogeography, Palaeoclimatology, Palaeoecology, Volume 211, Issues 1- 2, 19 August. I can locate several papers right this minute that show LIA impact in the Southern Hemisphere. Anyone having access to an academic library would, too. In fact, simply peruse the index of the last few years of Quaternary Research (four issues per volume, not too may issues to peruse). Lazy research, in my opinion. Somewhere recently, a geologist remarked that at the time of his commenting, there had been 1900 papers published on The Little Ice Age and Medieval Warm period and other recent fluctuations. Just tell Bjorck he is dreaming. Maybe it is a last surge at the IPCC trough. It is breathtaking to witness lifelong scientists prostitute themselves for an agenda. Well one thing that happens synchronously as you go back is that climate error bars get larger and larger. In this study, they compare a single southern hemisphere site to the Bond et al. 2001 Ice Rafted Debris history. That raises a red flag right there–1 site vs 1 site. There is NO reason to believe that a single site will track global changes. A shift in prevailing currents or winds could make a locality not track the global trends over this time span. Both data sets have dating difficulties as all sediment studies do. The original data is in a 2007 paper and is almost not described at all in this paper. The description of the implications of the figure are totally casual. The ability to detect and compare oscillations depends critically on the sampling density (not described) and the number of dating control points (not described). Measurement error and confounding factors could also reduce the appearance of synchrony between the two data sets. For example, lab error can be greater than the signal one wishes to detect. One almost never can just plot up 2 such graphs and make any sense of it per se. This is appalling. Most of the paper is a qualitative comparison of N and S hemisphere histories, again much too casually done, with no mention of dating error/issues or sampling/lab errors or data source reliability. It’s science as advertising–based on the principle that if something, however ill-founded, is said often enough, people start to believe it. And the general public are busy, or lazy, and don’t have time/skills to burrow into the data to evaluate the statements–and the specialists who do are not communicating effectively with the public. Except for blogs like yours of course and thank heaven for that. Really enjoy reading it. Keep it up! Are we having synchronous global warming now? I thought 33% of the temperature stations were reporting declines? The scale in Figure 1 seems wrong:– all temperatures are well below freezing? Also, the base line (at -32 degrees Centigrade) could be anywhere. +32 degrees Fahrenheit is freezing — perhaps the scale should be in F and translated? Svante Björck’s paper is peer reviewed and open access. I’d encourage everyone to read it and post their critical comments here. Just looking at the abstract, his logic is that since the past climate changes were so globally heterogeneous, the present globally uniform change should be considered anthropogenic. This is specious science in any case, because he’s arguing causality by induction. It’s also true that the resolution of past climate change is very poor compared to present instrumental records, and so we can’t know whether there were climate swings in the past equivalent to the small changes we see today..
Björck makes hay out of this poor resolution of past climate by saying that since we don’t know that the past had similar changes, we should conclude that the changes today are anthropogenic. And, of course, part of the reason climate change today seems so globally uniform is because all the local heterogeneity is removed by averaging. I think you’re being a bit too charitable. He presented what he presented because that is the perspective he supports. This used to be an open and informative website but recently has devolved into personal attacks on the people at the centre of the ‘Climategate’ controversy. Granted there is a lot not to like about the IPCC but they are no different than any other ‘Old Boys Club’. Read your own banner Anthony ‘Commentary on the puzzling things in life…’, and that includes other things than the climate. The human race is heading for a crisis, or perhaps many, that will result in one or more ‘Gigadeath’ events that might well kill off what we call ‘civilization’. The future will be one of walled continents, then walled countries and finally a devolution to walled cities as the population implodes and all that we call ‘human’ dies; unless we change the future. Focus on ways to avoid the first Gigadeath event or it will grease the slippery slope to barbarism. My personal attitude is that ‘Anything sufficiently procrastinated can be avoided entirely’ so how do we gain enough time to avoid Gigadeath? Rather than argue about the indirect effects humans might have on the planet via CO2 take direct action on direct effects. Prime amongst these is gross heat output. We humans produce somewhere in the neighbourhood of 17 terawatts of heat continuously (85% from fossil fuels) and all that heat must be having some effect. 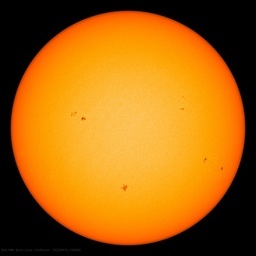 With difficulty the gaseous and particulate by-products of burning fossil fuels can be cleaned up and clean nuclear developed but that does nothing about the gross heat. The mystery is; why is all that heat not having more of an effect? It seems to me that the BESt study just showed that the warming of the last 200 year hasn’t been global either. Didn’t the y show that roughly 30% of the stations had actually cooled slightly. A mentally healthy scientists answers, (on the question if he has all his faculties together,) I think so. A CAGW (pseudo)scientists answers: Well, of course you little heretic, to believe anything else could in my definition possibly be complete lunacy. This here [INSERT “SCIENTIST’S” OWN NAME] thinks it might just be crazy to think otherwise! I’ll bet ten Quatloos that the real purpose behind Svante Björck’s paper was to get the above statement into the peer reviewed literature before the cut off date for AR5. If past is present, they will include his paper and ignore the rest thus resurrecting the ‘Hockey Stick’ temperature graph as gospel. This is the very definition of insanity. A delusion so intense that reality becomes irrelevant. Isn’t the procession of the equinoxes about 25,000 years so Norther summer/winter and the Perihelion/Aphelion swap about every 13,000 years? Given the difference in ocean/land ratios in the Northern/Southern hemispheres; no effect would mean physics is wrong. Dr. Easterbrook are you pulling an Anthony puzzle game on us? Globally synchronous is a contradiction in terms. Science at all levels freely admits they don’t fully understand the climate system so the idea of a synchronous system based on lack of understanding simply becomes generalizations and sooth saying. None of the data supports anything globally synchronous, its actually physically impossible if one looks at the global at any single point in time. Even during Ice age events, nothing, even poorly understood, appears to be globally synchronous. It is quite simple Svante Björck is a climate change denier. How could this statement get past reviewers!?? Maybe if he said “this supports” or “is consistent with” or “argues strongly in favor”. But when did “must be the cause” start to be used in publication conclusions, other than for bench-top experiments, and then with great trepidation? Ok you’re probably being sarcastic, but the term “climate change denier” is an idiotic contrivance of fools. Do they mean like say, how the NH polar ice cap is shrinking and the SH polar ice cap is growing in synchronisity? Like that? A case of aliasing. Right through the event. Oh, so now the Medieval Warm Period did happen, and its not being global is no longer proof that it did not happen? How could this statement get past reviewers!?? My question as well. This is as ametuerish a leap of faith as could be mustered, equvalent to saying that the flying spaghetti monster was having a bad hair day. Another assertion that was physically painful to read. Isn’t that just another warmed-over example of “the Argument from Ignorance”? Because it’s irrelevant in the whole scheme of things. Well, we geologists are the first found examples of ethanol based life…. This used to be an open and informative website but recently has devolved into personal attacks on the people at the centre of the ‘Climategate’ controversy. 1. It isn’t true. Any fair reader comparing this site with most of the CAGW sites couldn’t possibly conclude anything other than that this site is amongst the most open, tolerant, and polite sites on the entire internet. 2. Anyhow, when people’s behaviour is egregious enough, it is perfectly reasonably to attack their behaviour, and this will almost inevitably be taken as an attack on them personally. Someone boasts that they’ll redefine peer review to keep out those whose research disagrees with theirs? You don’t think that indicates a serious moral deficiency that can’t be challenged by any means except to say exactly that – that such behaviour is immoral? And how can one avoid saying that without the inference being drawn that a person deliberately and without remorse doing immoral things is an immoral person? Salting the next IPCC report? Who’s keeping track? I bet this ends up there. Appalling lack of references to back up the claims made, agree with Craig on the points he made above. I tossed it in the recycle bin. I dunno, maybe if some climate scientists spent more time in bars we’d all be better off. He’s paid to say this, what else can you expect. It’s preparation for the next IPCC report. I’m with Jimmy! Enjoying a “Fat Tire” while I tap this in. I’ve been wondering how long it would take before there was a concerted effort to erase the Holocene thermal excursions and even the hypsithermal. Didn’t even leave out the Younger Dryas. One wonders about the 8.2k event…..
Rather ironic that sceptics (of AGW) get called “deniers”. When things like this come from supporters (of AGW). Suppose the 1.7*10^16 watts of heat went into the oceans. The volume of the oceans is about 1.38^18 cubic metres http://hypertextbook.com/facts/2001/SyedQadri.shtml so human heat production would raise the temperature of the oceans at a heating rate of 1 Watt per 80 cubic metres of water which is 0.094 degrees per year, less the additional radiation into space via evaporation that probably equals this. So it could have some effect, I guess, or not. In fact the heat goes into the air and is rapidly vented into space (probably the following evening) by slightly elevating the height of storms a few feet (for example). If we subtract the endothermic storing of energy in biomass (which is later released when we burn it) from the total (because biomass is energy-neutral within the system) the number 1.7*10^16 is reduced. Actually I am not sure if you included biomass combustion (fields of stover, forest slash etc) in your 17 TWatts. It is usually ignored because it is burned by poor people. It used to be thought that black carbon (BC) fell from the sky within a few km of its sources (IPCC) so its effect was ‘local’. The extra heating caused by BC from biomass is substantial and may exceed that of CO2 but that would mean CO2 has a smaller effect than has been claimed for it because total forcing is known. Thus BC influence is in a perpetual state of ‘review’ with the admitted (published) value creeping upward each year. It also shades the ground lowering the surface temperature (think, Brown Cloud of India) while raising the temperature of the lower atmosphere. Interesting, neh? I don’t see what the problem is that some people seem to have with the conclusions of this paper. The LACK of credible evidence for a globaly synchronous change in temperatures during the MWP, Roman or Minoan warm periods, the Holocene optimum or the Younger Dryas events is well known. As is the see-saw relationship between North and South warming/cooling episodes. If the past climate was better defined by the proxy record it might be possible to claim with any validity that the MWP was warmer, or that the cooling during the YD event was global. It is the abscence of conclusive evidence which might be present if such events were TRUELY global that prevents any valid claim that past variations were global. While in the same way current temperature trends show a global consistancy that justifies the paper’s conclusions. Click my name and get some education. It’s not perfect but that too is education. I think it should help you evaluate WUWT better. BTW, some warmists here claim that I don’t refer to peer-reviewed stuff. This is actually untrue, but I start off talking about certain aspects of the scientific process and my own journey. There are plenty of peer-reviewed references – just put into what I believe is the correct place, which is subservient to “Nullius In Verba”, the practice of Scientific Method at all times, towards the material in question, towards questioners, towards oneself, and towards the nature of Scientific Method itself. My piece also puts the subject of this thread into perspective. The paper in question is indeed an affront to science but maybe done in the preparation for Durban. Research from both hemispheres clearly shows that the MWP was a global event. Arguing that an event is global and synchronous is like arguing that all swans are white. It only needs a single counter example (the black swan) to disprove the argument. The Younger Dryas was not a global event. in AR5 and ensure his place on the gravy train forever. If I hadn’t been brought up to be a cynic, the Team would have driven me to it. As a geologist, I resent Steve from Rockwood’s insinuation. Beer review? richardjamestelford and yet a hand full of trees from one area does provide proof of a global issue , how does that work? Interesting and why it warmed since 150 years when CO2 human contribution was irrelevant is not clarified. Good that nowadays such papers are fast debunked in blog reviews the new peer review. Thank you for the site here, keep on the good work! But then the claim that a handful of trees from one area provides ‘proof'(sic) of a global issue is unsupported by ANY scientific research and would appear to be a figment of the imagination ? Thanx for your opinion. But the MWP was warmer than today, as were several other even warmer times during the Holocene. Sorry if that ruins your belief in CAGW. What evidence is there for a GLOBALLY warmer climate? SOME regions were warmer than now, some were colder and the evidence – uncertain as it is – it that those warm periods were not simultaneous and only local. It is foolishness like this that make my geolscience blood boil. Björks’ paper is not science, it is pseudoscience. Esterbrook is far to kind in his review. I wrote an essay yesterday at my blog Called Shoddy Science,(http://retreadresources.com/blog/?p=904) It is not about Björks but about Pasture and others. Unfortunately Björks’ work fits right in. He is in good company however at least from the history of science point of view. I once worked as a contractor for a government agency. All incoming correspondence had to be imaged. We got a document one day that was a book really. Hand written with various implements (including crayon), it included dozens and dozens of polaroids of dead and mutilated rats. Written by, apparently, a mentally disturbed homeless person the tome claimed (in almost scientific sounding terms) that it proved that aliens were coming down to Earth and slaughtering and experimenting upon the rats – then they ate their brains. The “treatise” went downhill from there. It really didn’t make much more sense than that. Stripped of its religious overtones, the only true “gigadeath” events are the 4 Horsemen – Pestilence, War, Famine, and Death. I think we can do something about the first 3. The 1.21 gigawatts hasn’t fried us yet, nor will it. You do know that Earth is a giant rock traveling through space, right? It genuinely frightens me to think people like this are voters. Isn’t he really arguing that to our knowledge no warming in the past 20.000 years was ever caused by co2? Got plenty more evidence if you want it. 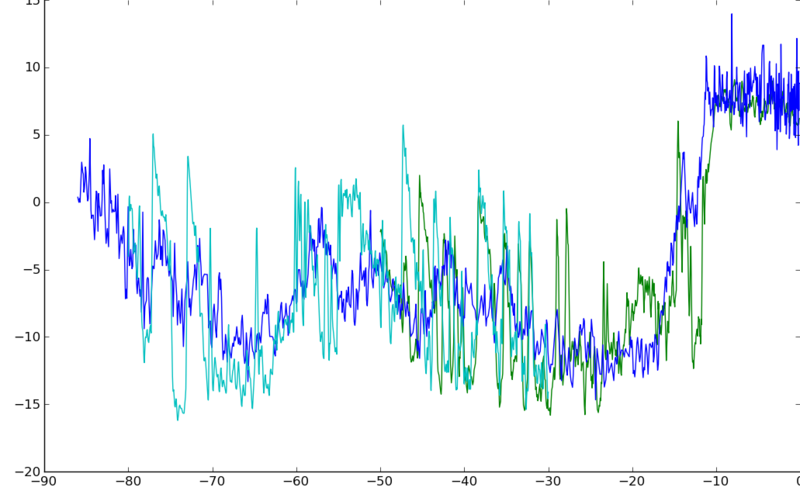 And it has a fantastic comparative bit built in that lets you see the warming side by side for different studies. It would appear that science can produce numbers which can be interpreted whichever way one wants. Much like profit and loss accounts from companies, amazing what you can do with numbers. History shows that Hannibal could not have crossed the Alps in todays climate as he would have found snow and ice blocking his route, so it was warmer then by a fair extent. The Vikings were farming on Greenland in the MWP, that was still very much part of the Viking history taught in Norway up to at least the late 70’s when I was studying there. All of a sudden these issues are “forgotten” by those who make a living out of this, as they alone would totally destroy the theory that the world has never seen anything like this, like this being .6 degr C warming caused by the UHI effect. I guess they are right in the MWP or in Hannibal’s time the UHI would have been non existent so we are seeing something never witnessed before. Let’s move those thermometers and this whole issue will disappear. This used to be an open and informative website but recently has devolved into personal attacks on the people at the centre of the ‘Climategate’ controversy…..
Harvey, I suggest you take a good hard look at figure #1. Then think about the following peer reviewed paper from 2007. A couple of degrees increase in temp do not worry me nearly as much as the 10C or more drop we KNOW is waiting somewhere in the future. “I don’t see what the problem is that some people seem to have with the conclusions of this paper. Izen, if one takes only the sea level as proxy is enough to debunk this. The romans were planning in advance building shipyards waiting for the water to rise? The study shows there is not much correlation to the climate on one island in the mid of Atlantic? How much did the climate change nowadays on the island lying some 2500 from the nearest shore? Zero, nada. Good place to spend the holiday to study climate. Isn’t it true that the “current warming” is generally not evident in the southern hemisphere to any great extent? I know it is not evident in the United States where most of the country has cooled in the last hundred years according to the longest record rural stations. wouldn’t this mean this one isn’t global either by the same standard? Correct, Anna, except it passed journal peer review, and so now it’s accepted science. This is the sad state to which those who politicized climate science have brought us, that such obviously false arguments pass review. There is a hockey stick alright … one with the blade pointed downward. The handle began about 10K YBP, we are on the handle, headed for the blade. 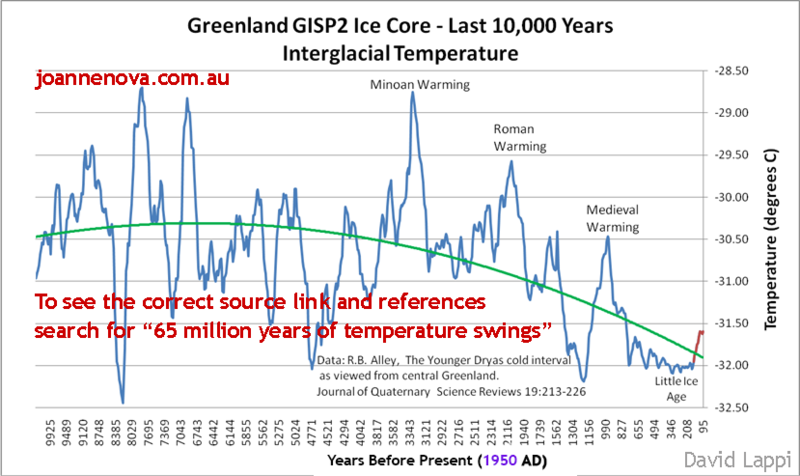 There have been at least 7 periods in the last 11,000 years warmer than now in the current inter-glacial era, (all occured without any increase in the CO2 levels). 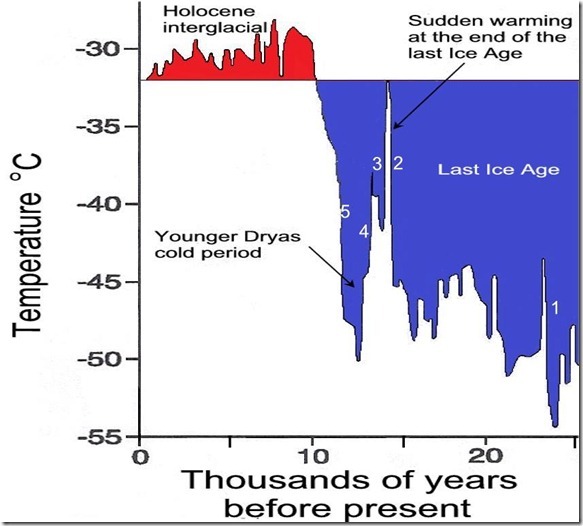 (The last 4 interglacial periods were also warmer than our current one). Data taken from the greenland ice sheet shows this, (Alley,2000) GISP2 (US Govt. ice core data). And; Alley, R.B. 2000. The Younger Dryas cold interval as viewed from central Greenland. Quaternary Science Reviews 19, 213-226. CO2 has either no relationship or an inverse one to temperature. The Earth’s temperature is regulated through a negative feedback mechanism involving the OLR (Outgoing Longwave Radiation), and has for billions of years. The OLR can vary be 80 Wm2 over a 6-month timescale (as it did in 2010/11); saying the our human emissions (that total less than 2 Wm2 of warming) control the climate is rediculous. As far as the Earth’s climate goes, human CO2 emissions are Irrelevant. Would you accept a global temperature estimate based on a single monitoring station? So why do you think that a single point on Greenland can meaningfully represent the whole world? There are many not just Greenland showing the same thing all over the world. With greenland having similar trends as global temperatures during the instrumental record. The ice cores in both hemispheres show a similar trend. This is one of the most ignorant papers ever reproduced and as though not looked at any of the many hundreds of peer reviewed papers showing changes in all different regions of the globe. Africa, Asia, New Zeland/Australia, Europe, North America and oceans not good enough? In a paper entitled “Current global warming appears anomalous in relation to the climate of the last 20 000 years,” Svante Björck claims that, over the past 20,000 years, there have been no world-wide, synchronous, climate changes until recently and that shows CO2 must be the cause of recent global warming. More about that stuff later. “ there is a difference between argument and explanation. If we’re interested in establishing A, and B is offered as evidence, the statement “A because B” is an argument. If we’re trying to establish the truth of B, then “A because B” is not an argument, it’s an explanation. The Ad Hoc fallacy is to give an after-the-fact explanation which doesn’t apply to other situations. Often this ad hoc explanation will be dressed up to look like an argument. BTW. 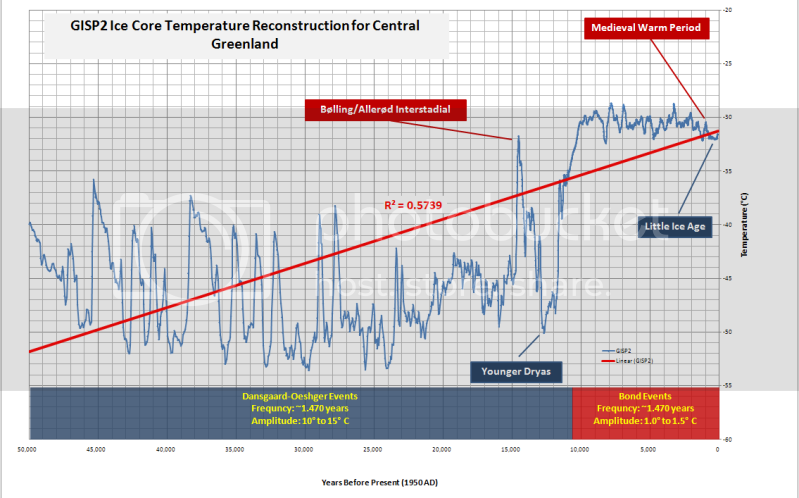 A simple evidence is that not only well known ‘global’ temperature reconstructions of A. Moberg et al. (and many others) exhibit a similar temperature pattern for the last (two) millennia as the pattern of T. Kellerhals et al. from the Bolivian Andes, but both temperature proxies and many other easy can be computed out of solar tide configurations of some two or 6 or more celestial couples for +- 3000 years (-5000 years + 1000 years). Maybe another fallacy results in problems in this time of authorities who possibly are not authorities in all science disciplines. Unfortunately consumers like more the fight of authorities in the arena than strong arguments.